Scotch & Soda, an Amsterdam-based fashion brand known around the world for its youthful but classic style, needs to drive sales and re-engage existing user purchase behavior. They work with Emark, a Salesforce Platinum Marketing Cloud partner, to build out 1-to-1 customer journeys using CRM powered advertising. 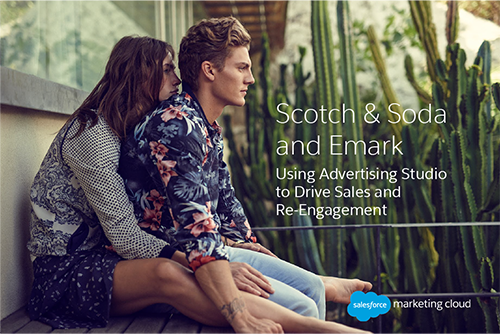 Scotch & Soda used email and Facebook ads to target existing customers across multiple channels. This re-engagement campaign to inactive customers resulted in a 16x the return on ad spend. To drive new sales, a Facebook Lookalike audience of Scotch & Soda best customers was targeted resulting in a €3.95 cost per checkout.